We keep hearing about the many benefits of natural gas–how burning it releases less CO2 than oil or coal, and how it burns with few impurities, so does not have the pollution problems of coal. We also hear about the possibilities of releasing huge amounts of new natural gas supplies, through the fracking of shale gas. Reported reserves for natural gas also seem to be quite high, especially in the Middle East and the Former Soviet Union. But I think that people who are counting on natural gas to solve the world’s energy problems are “counting their chickens before they are hatched”. Natural gas is a fuel that requires a lot of infrastructure in order for anything to “happen”. As a result, it needs a lot of up-front investment, and several years time delay. It also needs changes on the consumption side (requiring further investment) that will allow this natural gas to be used. If the cost is higher than competing fuels, this becomes a problem as well. In many ways, natural gas consumption is captive to other things that are happening in the economy: an economy that is industrializing rapidly will easily be able to consume more natural gas, but an economy in decline will find it hard to scrape together funds for new ways of doing what was done previously, now with natural gas. Increased use of renewables seems to call for additional use of natural gas for balancing, but even this is not certain, because in many parts of the world, natural gas is a high-priced imported fuel. Political instability, often linked to high oil and food prices, creates a poor atmosphere for new Liquefied Natural Gas (LNG) facilities, no matter how attractive the pricing may seem to be. In the US, we have already “hit the wall” on how much natural gas can be absorbed into the system or used to offset imports. 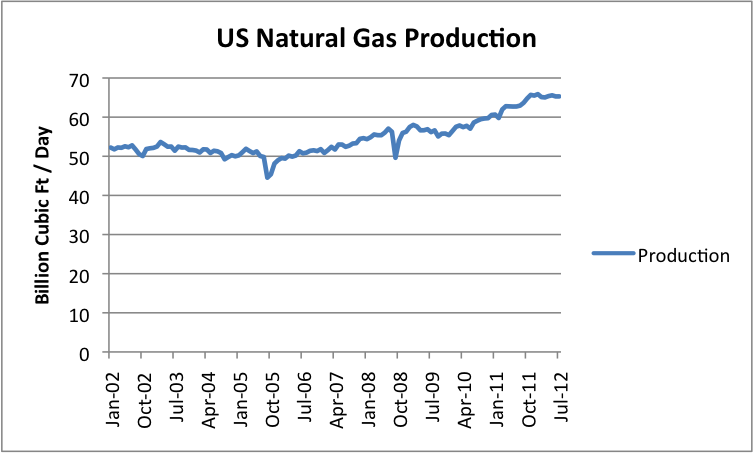 US natural gas production has been flat since November 2011, based on EIA data (Figure 1, below). Figure 1. US Dry Natural Gas Production, based on data of the US Energy Information Administration. Even with this level of production, and a large shift in electricity production from coal to natural gas, natural gas is still on the edge of “maxing out” its storage system before winter hits (Figure 2, below). Figure 2. US natural gas in storage, compared to five-year average. Figure prepared by US Energy Information Administration, Weekly Natural Gas Storage Report as of October 5, 2012. The past isn’t the future, but it does give a little bit of understanding regarding what the underlying trends are. Figure 3. 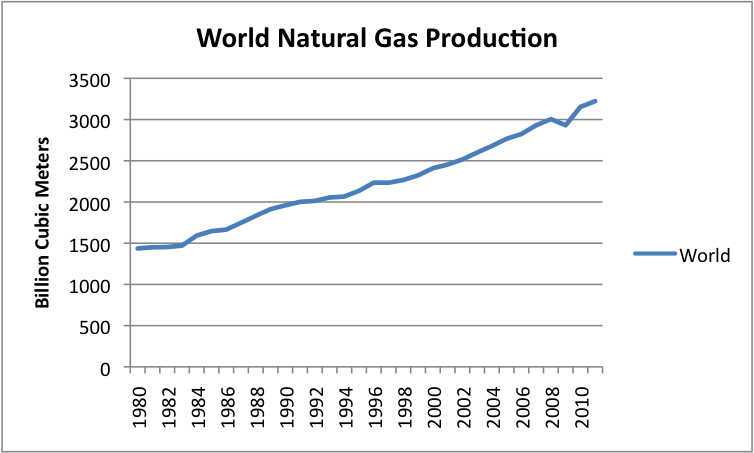 World natural gas production, based on BP’s 2012 Statistical Review of World Energy data. World natural gas production/consumption (Figure 3) has been increasing, recently averaging about 2.7% a year. If we compare natural gas to other energy sources, it has been second to coal in terms of the amount by which it has contributed to the total increase in world energy supplies in the last five years (Figure 4). This comparison is made by converting all amounts to “barrels of oil equivalent”, and computing the increase between 2006 and 2011. Figure 4. 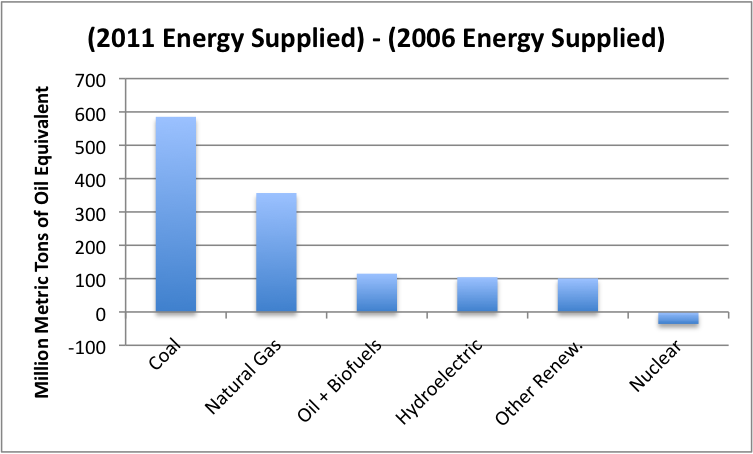 Increase in energy supplied for the year 2011, compared to the year 2006, for various fuels, based on BP’s 2012 Statistical Review of World Energy data. In order for natural gas to be an energy savior for the world, natural gas consumption would need to increase far more than 2.7% per year, and outdistance the increase in coal consumption each year. While a modest increase from past patterns is quite possible, I don’t expect a miracle from natural gas. Natural Gas: What Has Changed? Even before the discovery of shale gas, reported world natural gas reserves were quite high relative to natural gas production (63.6 times 2011 production, according to BP). Reserves might theoretically be even higher, with additional shale gas discoveries. In addition, the use of Liquified Natural Gas (LNG) for export is also increasing, making it possible to ship previously “stranded” natural gas, such as that in Alaska. This further increases the amount of natural gas available to world markets. What Stands in the Way of Greater Natural Gas Usage? 1. Price competition from coal. One major use for natural gas is making electricity. If locally produced coal is available, it likely will produce electricity more cheaply than natural gas. The reason shale gas recently could be sold for electricity production in the United States is because the selling price for natural gas dropped below the equivalent price for coal. The “catch” was that shale gas producers were losing money at this price (and have since dropped back their production). If the natural gas price increases enough for shale gas to be profitable, electricity production will again move back toward coal. Many other parts of the world also have coal available, acting as a cap on the amount of fracked natural gas likely to be produced. A carbon tax might change this within an individual country, but those without such a tax will continue to prefer the lower-price product. Figure 5. 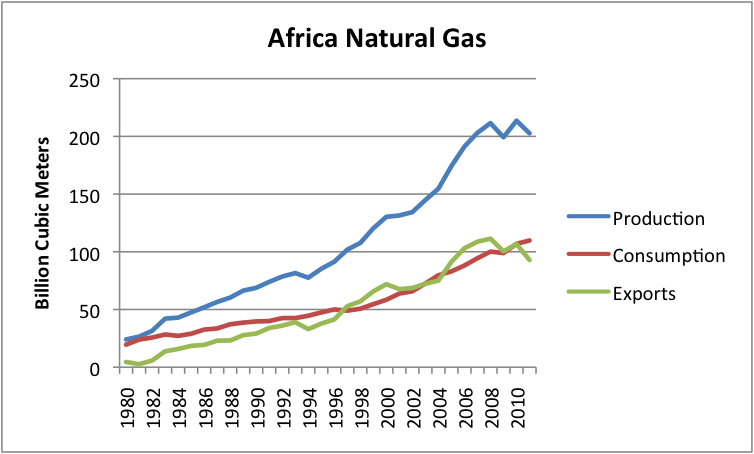 Africa natural gas production, consumption, and exports, based on BP’s 2012 Statistical Review of World Energy. In Africa, (mostly northern Africa, which exports to Europe and Israel), consumption has been rising fast enough that exports have leveled off and show signs of declining. 3. Political instability. Often, countries with large natural gas resources are ones with large oil resources as well. If oil production starts to drop off, and as a result oil export revenue drops off, a country is likely to experience political instability. A good example of this is Egypt. Figure 6. 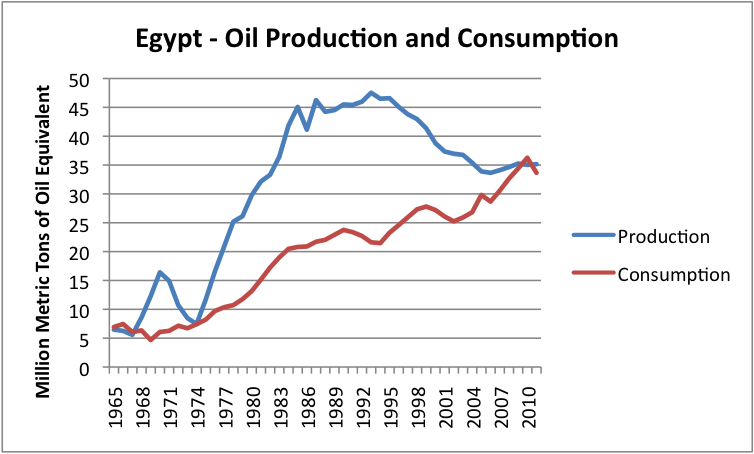 Egypt’s oil production and consumption, based on BP’s 2012 Statistical Review of World Energy. No matter how much natural gas Egypt may have, it would not make sense for a company to put in an LNG train or more pipeline export capability, because the political situation is not stable enough. Egypt needs oil exports to fund its social programs. The smaller funding amount available from natural gas exports is not enough to make up that gap, so it is hard to see natural gas making up the gap, even if it were available in significant quantity. Iran is a country with large natural gas reserves. It is reportedly looking into extracting natural gas for export. Again, we have a political stability issue. Here we have an international sanctions issue as well. 4. “Need the natural gas for myself later” view. A country (such as Egypt or the United States or Britain) that has been “burned” by declining oil production may think twice about exporting natural gas. Even if the country doesn’t need it now, there is a possibility that vehicles using natural gas could be implemented later, in their own country, thus helping to alleviate the oil shortage. Also, there are risks and costs involved with fracking, that they may not choose to incur, if the benefit is to go to exporters. 5. Cost of investment for additional natural gas consumption. In order to use more natural gas, considerable investment is needed. New pipelines likely need to be added. Homeowners and businesses may need to purchase gas-fired furnaces to raise demand. If it is decided to use natural gas vehicles, there is a need for the new vehicles themselves, plus service stations and people trained to fix the new vehicles. Additional natural gas storage may be needed as well. Additional industrial production is difficult to add, unless wages are low enough that the product being sold will be competitive on the world market. Existing “pushes” toward better insulation have the effect of reducing the amount of natural gas used for heating homes and businesses, so work in the opposite direction. So do new techniques for making nitrogen-based fertilizer using coal, rather than using natural gas. 6. Touchy balance between supply and consumption. If additional production is added, but additional uses are not, we have already seen what happens in the United States. Storage facilities get overly full, the price of natural gas drops to unacceptably low levels, and operators scramble to cut back production. The required balance between production and consumption is very “touchy”. It can be thrown off by only a few percent change in production or consumption. Thus an unusually warm winter, as the United States experienced last year, played a role in the overly full storage problem. A ramp up of production of only a few percent can also cause an out of balance situation. Unless a developer has multiple buyers for its gas, or a “take or pay” long-term contract, it risks the possibility that the gas that is has developed will not be wanted at an adequate price. 7. Huge upfront investment requirements. There are multiple requirements for investing in new shale gas developments. Each individual well costs literally millions of dollars to drill and frack. The cost will not be paid back for several years (or perhaps ever, if the selling price is not high enough), so debt financing is generally needed. If fracking is done, a good supply of water is needed. This is likely to be a problem in dry countries such as China. There is a need for trained personnel, drilling rigs of the right type, and adequate pipelines to put the new gas into. While these things are available in the United States, it likely will take years to develop adequate supplies of them elsewhere. All of the legislation that regulates drilling and enables pipeline building, needs to be in place as well. Laws need to be friendly to fracking, as well. 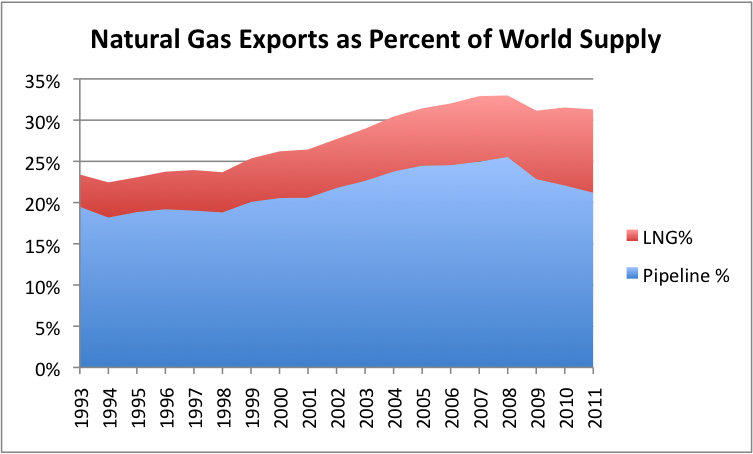 Exports grew as a percentage of natural gas use through about 2007 or 2008. Figure 7. World natural gas exports as percentage of total natural gas produced, by year, based on EIA data (older years) and BP’s 2102 Statistical Review of World Energy for 2010 and 2011. In recent years, natural gas exports have fallen slightly as a percentage of total gas extracted. Thus, if world natural gas supplies have risen by an average of 2.7% per year for the past five years, exports available for import have risen a little less rapidly than the 2.7% per year increase. A major ramp-up in export capability would be needed to change this trend. While we hear a lot about the rise in exports using LNG, its use does not seem to be adding to the overall percentage of natural gas exported. Instead, there has been a shift in the type of export capacity being added. There are still a few pipelines being added (such as the Nord Stream pipline, from Russia to Germany), but these are increasingly the exception. Exactly what price is needed for shale gas to be profitable is subject to debate. Shale gas requires the payment of huge up-front costs. Once they are drilled and “fracked,” they will produce for a long period. Company models assume that they will last as long as 40 years, but geologist Arthur Berman of The Oil Drum claims substantial numbers are closed down in as few as six years, because they are not producing enough natural gas to justify their ongoing costs. There is also a question as to whether the best locations are drilled first. Logically a person would expect shale-gas to be quite a bit more expensive to produce than other natural gas because it is trapped in much smaller pores, and much more force is required to extracted it. In terms of the resource triangle that I sometimes show (Figure 8, below), it epitomizes the low quality, hard to extract resource near the bottom of the triangle that is available in abundance. 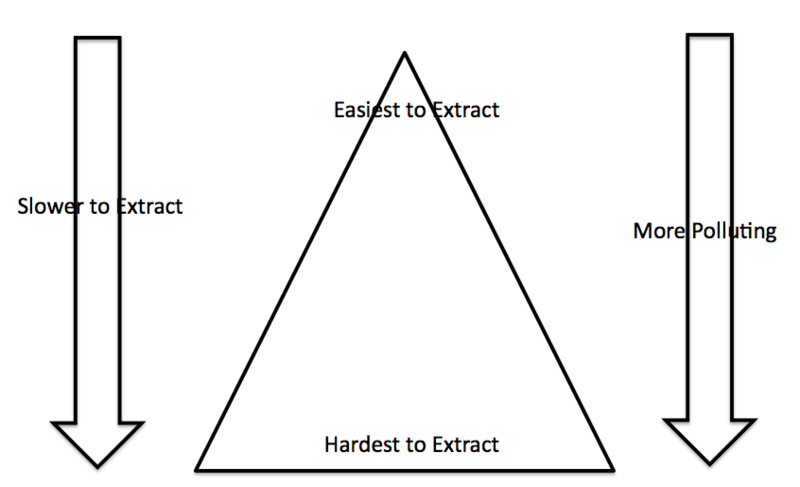 We usually start at the top of the resource triangle, and extract the easiest and cheapest to extract first. Figure 8. Author’s illustration of impacts of declining resource quality. Berman claims that prices $8.68 or higher per million Btu are needed for profitability of Haynesville Shale, and nearly as high prices are needed to justify drilling other US shale plays. The current US price is about $3.50 per million Btu, so to be profitable, the price would need to be more than double the current US price. Prices for natural gas in Europe are much higher, averaging $11.08 per million Btu in September 2012, but shale gas extraction costs may be higher there as well. The US Energy Information Administration admits it doesn’t know how the economics will work out, and gives a range of projected prices. It is clear from the actions of the natural gas industry that current prices are a problem. According to Baker Hughes, the number of drilling rigs engaged in natural gas drilling has dropped from 936 one year ago to 422, for the week ended October 12, 2012. 1. How much will intermittent renewables continue to ramp up? Governments are getting poorer, and have less funds available to subsidize them. They do not compete well on when they go head to head with fossil fuels, nuclear, and hydroelectric. 2. When intermittent renewables are subsidized with feed in tariffs, and requirements that wind power be given priority over fossil fuels, it can provide such an unlevel playing field that it is difficult for natural gas to be profitable. This is especially the case in locations where natural gas is already higher-priced than coal. Our economy is built of many interdependent parts. Each business is added, taking into account what businesses already are in place, and what laws are in effect. Because of the way the economy currently operates, it uses a certain proportion of oil, a certain proportion of natural gas, and more or less fixed proportions of other types of energy. The number of people employed tends to vary, too, with the size of the economy, with a larger economy demanding more employees. Proportions of businesses and energy use can of course change over time. In fact, there is some flexibility built in. In particular, in the US, we have a surplus of natural gas electricity generating units, installed in the hope that they would be used more than they really are, and the energy traded long distance. But there is less flexibility elsewhere. The cars most people drive use gasoline, and the only way to cut back is to drive less. Our furnaces use a particular fuel, and apart from adjusting the temperature setting, or adding insulation, it is hard to make a change in this. We only make major changes when it comes time to sell a car, replace a furnace, or add a new factory. The one sure way to ramp up natural gas usage is for the economy as a whole to grow. If this happens, natural gas usage will grow for two reasons: (1) The larger economy will use more gas, and (2) the growth in the economy will add more opportunities for new businesses, and these new businesses will have the opportunity to utilize more natural gas, if the price is competitive. I have compared the situation with respect to limited oil supply as being similar to that of a baker, who is trying to bake a batch of cookies that calls for two cups of flour, but who has only one cup of flour. The baker is able to make only half a batch. Half of the other ingredients will go unused as well, because the batch is small. To me, discovering that we have more natural gas than we had before, is analogous to the baker discovering that instead of having a dozen eggs in his refrigerator, there are actually two dozen in his refrigerator. In fact, he finds he can even go and buy more eggs, if he is willing to pay double the price he is accustomed to paying. But the eggs really do not fix the missing cup of flour problem, unless someone can find a way to change eggs into flour very cheaply. To me, the most basic forms of energy resources are (1) coal and (2) oil. Both can be transported easily, if it is possible to extract them. Natural gas is very much harder to transport and store, so it is in many ways less useful. It can be made work in combination with oil and coal, because the use of coal and oil make it possible to build pipelines and make devices to provide compression to the gas. With coal and oil, it is also possible to make and maintain electric transmission lines to transport electricity made with natural gas. I sometimes talk about renewable energy being a “fossil fuel extender,” because they hopefully make fossil fuels “go farther”. In some ways, I think natural gas is an extender for oil and coal. It is hard to imagine a society powered only by natural gas, because of the difficulties in using it, and the major changes required to use it exclusively. In the earliest days, natural gas was simply a “waste product” of oil extraction. It was “flared” to get rid of it. In many parts of the world, natural gas is still flared, because the effort it takes to collect it, transport it, and make it into a useful product is still too high. The hope that natural gas will be the world’s energy savior depends on our ability to make this former waste product into a product that will replace oil and coal. But unless we can put together an economy that needs and uses it, most of it probably will be left in the ground. The supposedly very high reserves will do us no good. This entry was posted in Alternatives to Oil and tagged coal, fracking, natural gas, natural gas exports, oil. Bookmark the permalink. Overall, I found this “an essay in search of a thesis”. Based on the commentary, somehow a still fairly thoughtful overview of natural gas in the oil and gas complex became a paean to the survivalist movement. a) The btu relationship between oil and gas is 5.8/1 (usually rounded up to 6/1). Even if gas needs $8/mcf to make money (which I highly doubt) that means gas wherever substitutable is a positive deal when oil costs more than $46.40/b. Infrastructure cost to develop some switching capability is real, but with WTI no lower than $75/b since 10/09 this is a no-brainer. It is the core reason you are hearing and reading about efforts to increase the use of natural gas throughout our economy, all ancillary issues ignored. This is the reason LNG for heavy truck transportation is growing rapidly on a percentage basis (from a tiny base) and will become significant over the next five years. b) I’m quite familiar with Berman’s work. I think his survivorship bias argument is silly: after enough wells are drilled the better ones lift the average overall. Of course, that is what statistical averages are all about! However, I do agree with him that exponential versus hyperbolic curves are likely more accurate, and EUR’s may well be overstated on that basis. The thing is–who cares? EUR is a metric for Wall Street’s financial tenderfeet. The wells are largely done in 4-5 years. A well that plods along at 7% of original production for 20 years has almost zero present value. From an economic point of view this is a result without an argument. I assure you if you corner a real gasman and offer some good whiskey, he will tell you that investment in drilling is made based on availability of funds for drilling; their read of the market’s enthusiasm for production growth; and the future’s forward curve a couple of years out. NGL content is also important, and gas associated with oil production is considered free. The one assertion in the article that I most strongly agree with is the idea that nat gas is an oil extender. Vehicles can be operated on natural gas, and in some parts of the world nat gas is actually the dominant transportation fuel. Gas is not a coal extender. Coal and gas are mortal enemies as coal is primarily used to generate electricity. Coal is itself a mature fuel (not unlike oil) and the age of “cheap coal” is rapidly declining. And while the article asserts that coal is easy to transport that does not mean cheap. A significant portion of the cost of Powder River Basin coal is the cost to rail it to end markets. Regarding Chinese shale, let’s remember the majority of gas supply growth in China piped gas from Central Asia (not cheap) and LNG (more expensive still). Indigenous shale has a very low hurdle to climb to be economically viable on that basis. It can be quite expensive to extract and still be a very attractive energy source to the Chinese. Finally, the most important point in all of the article and follow-on commentary is Gail’s last post. Climate change; big enviro’s; sustainable energy; all of this stuff avoids the nasty truth: there are too many people around and their numbers continue to grow. The natural resource problem is a population problem. Thing is, if you were a professional environmental fund raiser would you be smart to tell people to give you money so you could spread the word about how people should use contraception and plan to have one or even better no children? If you did, you would have a very short fund-raising career. Much better to demonize oil and gas companies and sell pie-in-the-sky fantasies about how “technology” will save us all if we only “force greedy companies to do what’s right” usually with the cudgel of government. We have just experienced 4 years of the most liberal administration in recent memory without much to show on this front. In fact, the Obama administration began as sworn enemies of both oil and gas and have had to back down on gas because of the jobs it has generated while little else from the government’s initiatives has produced similar results. You are right about the fact that the issue is ultimately a population problem. We can argue about whether or not natural gas will hold things together are little longer, but as long as population keeps rising, and oil and coal production are constrained, we have a big problem. Thank you for explaining the demerits of natural gas with graphical presentation. It is really an useful information.